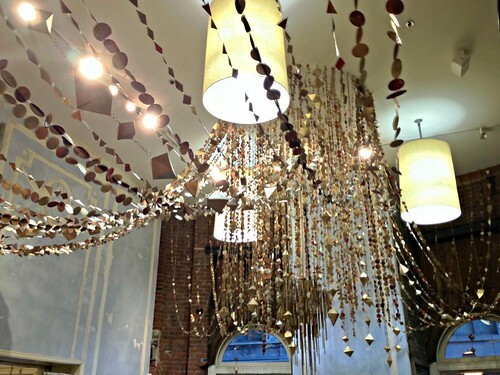 Not one to let the holidays fade away too quickly, let me show you decorations I spotted at the Anthropologie flagship store just before Christmas. On an unusually mild Saturday my husband and I drove up to Philadelphia to visit our son and take in the sights. A few shoppers on the busy streets were even wearing shorts; definitely my kind of winter weather! 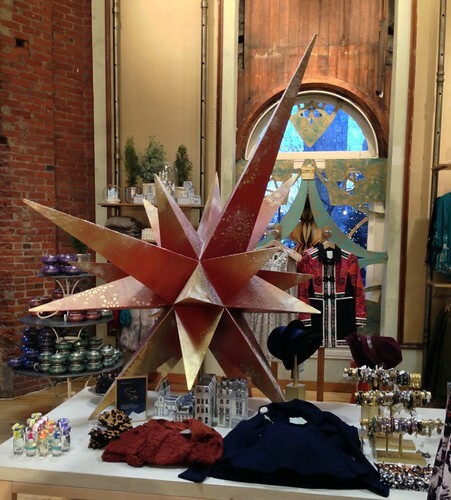 After having dinner in a little cafe, my well-fed (and thus agreeable toward shopping) men and I went across the street to check out Anthropologie on Rittenhouse Square. 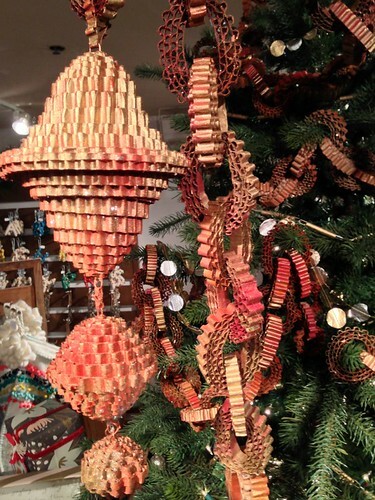 The mission, of course, was to see the many ways paper and cardboard had been incorporated in the holiday decorations. I don't think my guys quite believed we would find a blog-worthy photo op, but the Anthro display artists never disappoint. 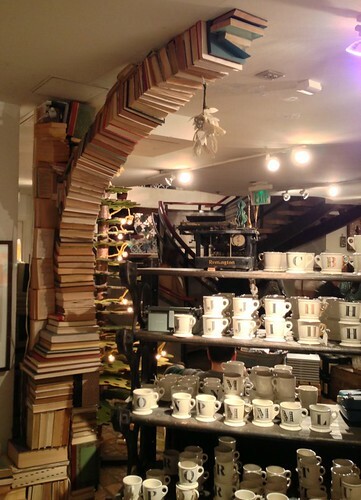 This particular store is housed in an old and beautiful Beaux Arts-style mansion that spans four floors. I felt like I was playing a real life game of I Spy... festive paper delights were everywhere. Look up! 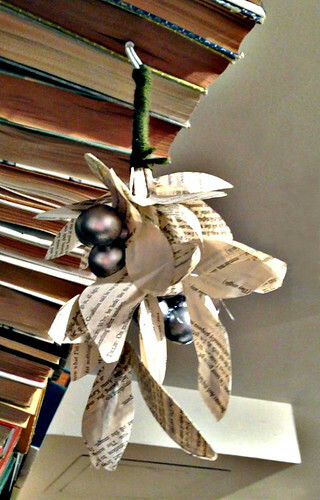 There were even tiny treasures like a mistletoe sprig on this gravity-defying book arch. I seem to remember ever-so-lightly tapping this dramatic star and determining it was metal, but hey, a paper version would be gorgeous too. 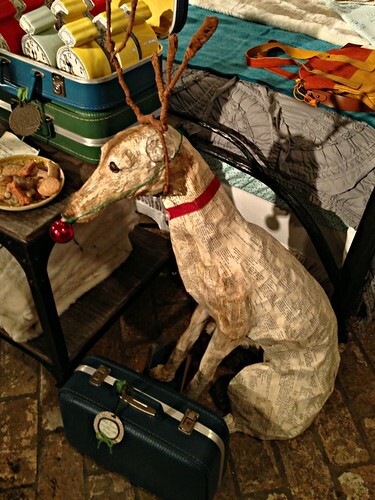 Aww, a paper mache Rudolph-hound. 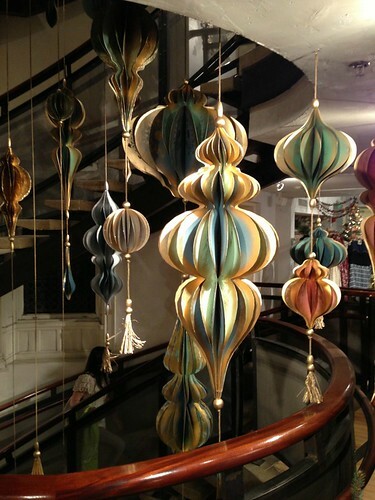 The hands-down winners in my book though... elegant paperboard ornaments that filled the spiral stairwell - beautiful! I'm already looking forward to going back to see the spring decor. Wonderful! Happy New Year, Ann. That paper mache dog looks like the dog from How the Grinch Stole Christmas. 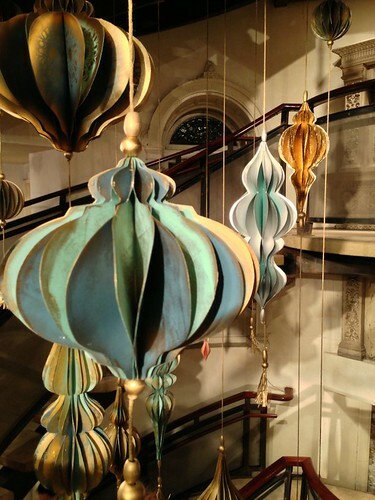 Beautiful decor - thanks for sharing it! WoW!!! What a wonderful surprise and lucky you for being able to find and enjoy! Have a wonderful New Year! Wow! What a fun way to go "shopping"! I hope your guys enjoyed it as much as I did. Thanks for taking us on the tour! How lovely! We have an Anthropol. in Edinburgh but I've hardly ever been inside. Must have a look. ann..what a delight for you to see such wonderful paperworks all in one store!! i love the rudolph dog...the bookarch and yes those large ornaments tassels and all are just magic!! thanks for the tour! Happy New Year to you too, Isabelle! Licia, you are so welcome. This was one of those fun posts that practically writes itself! Happy New Year Ann this looks to be a great book. 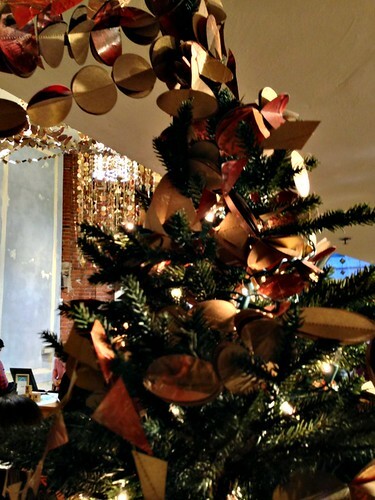 Love the decorations, especially the star!